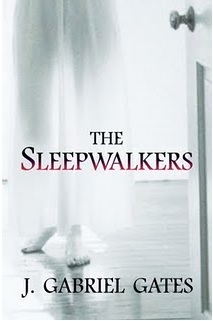 The Sleepwalkers- J. Gabriel Gates. Privileged and popular Caleb Mason is celebrating his high school graduation when he receives a mysterious, disturbing letter from his long-lost childhood playmate, Christine. Caleb and his jokester friend Bean decide to travel to his tiny hometown of Hudsonville, Florida, to find her. Upon arrival, they discover the town has taken a horrifying turn for the worse. Caleb’s childhood home is abandoned and his father has disappeared. Children are going missing. The old insane asylum has reopened, and Christine is locked inside. Her mother, a witch, is consumed with madness, and Christine’s long-dead twin sister whispers clues to Caleb through the static of an A.M. radio. The terrifying prophesies of the spirits are coming to pass. Sixteen clocks are ticking; sixty-six murdered souls will bring about the end of the world. As Caleb peels back layer after layer of mystery, he uncovers a truth more horrible than anything he had imagined, a truth that could only be uttered by the lips of the dead. I feel like I’m a sleepwalker right now. BEAN… seriously, I love this guy, every word that came out of his mouth made me chuckle to myself and want to marry him. And.. um, Caleb.. yeah he was OK too, I guess. Small towns where nothing happens, well except all the HORROR. And no one can hear you scream. Genuinely creepy, definitely not one for bed times. Spectacular writing. I know some people, for whatever reason, are morally opposed to present tense but I’ll tell you, itreally works in this book. Mr Gates has a tremendously visual writing style and it’s so affective….and HORRIFYING. White noise. Sleepwalkers. Nightgowns. Dream centres. Underground sewers. Witches. Mention of cake (always a high point). Best friends. Satanic rituals. Psychopaths. And that end sentence… *shudder*. There is a lot going on in this book. When I read books, I often find myself coming up with questions that I’d like to ask the author… whether it’s just out of curiosity or whether it would clear something in the plot up for me. When I ended up with about 20 questions about the ending alone, I knew something must be a bit off. Even I can’t be that dim. Debatable, I know. But come on. The whole idea of the book was so original and exciting but it often seemed that Gates had so many good ideas running through his head that he felt compelled to include every single one of them into the story, sacrificing coherence in some places. But saying that, I’d rather a book be confusing than dull. And this book was definitely not dull. This book also terrified the living crap out of me…. So yeah, there’s that too. Oh Christine, sweet, beautiful and potentially psychopathic Christine. I don’t really want to say anything about her because it’s best to leave things unsaid…. But I’ll say one thing. Managing to be irresistible to a boy while wearing a nightgown and crazy eyes? Brava, Christine, brava. Bean. Be still my beating heart. Read: Bean is my guy. You will probably notice that I have missed out one of the major subjects here… but I don’t want to talk about it just in case they come and get meit’s for the best. TRUST ME. 8/10. Man, this book put me through the ringer. I’m not sure whether it was because I had no idea what was going on for large sections so I was constantly on edge waiting for sweet, sweet clarity but… yeah. My neighbour deciding that this weekend would be a good time to use effin’ POWER TOOLS sporadically did not help this matter either. My nerves are in shatters. There were a few long pages full of Caleb feeling sorry for himself and generally doing the jitterbug…But considering what kind of mental things are happening around him…. I think I can let this one slide. People who like psychological thrillers. People who like original ideas. People who don’t mind being completely confused by a story. People who once woke up in the middle of their school field with a bottle of Jagermeister next to them and wondered what the eff just happened. People who think they could work it in a floor-length nightgown. People who would eat cake off an envelope if they dropped it on, too. People who would just close the door if they saw a racoon in their bath and go and make a sandwich. People who wouldn’t think twice about approaching a crazy naked lady performing satanic rituals in her garden. People who think that grinding their teeth at night is strange… just you wait,‘enry ‘iggins, just you wait. this one sounds just a bit too trippy for me… I think Id prefer to see a movie of something with a synopsis like that!